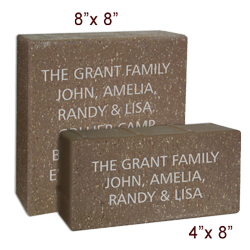 Commemorative Bricks are a recognition and giving opportunity designed for you and your loved ones to build a lasting legacy by paving the way for future generations of Christian Science youth. Whether you want to honor someone who has had a meaningful impact on your life, or commemorate your time at the A/U Ranches or in DiscoveryBound, we have a place for you to leave your message in stone. We bought a brick to support the future leaders in the Christian Science movement. The Adventure Unlimited and DiscoveryBound organization is so important to the demonstration of Christian Science in the world. Each personalized engraved brick will become a permanent part of the A/U Ranches. Bricks will pave the walkway and patio at the new Hub, scheduled to begin this year! Your brick is 100% tax deductible as a charitable donation. Gift certificates are available, allowing the recipient to choose his or her own inscription. Proceeds help support Adventure Unlimited’s $2.8 million Annual Fund for continued year-round programs for Christian Science youth. There are two brick sizes to choose from: 8″ x 8″ or 4″ x 8″. To order your brick today, you can order online. 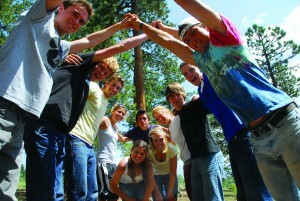 If you have any questions, you may contact our Foundation Manager, at 303.779.3000 x107 or by email.